If you have been following the posts till now, this post is as simple as it can be! 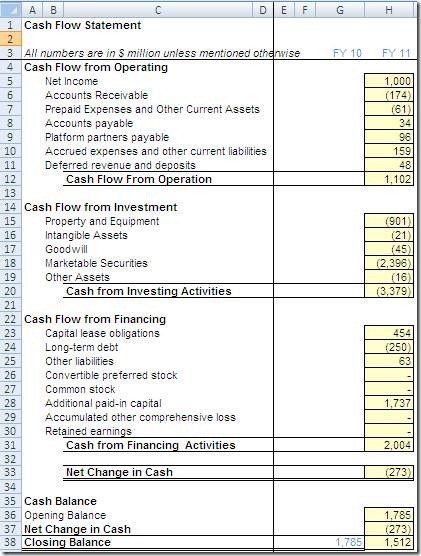 This just releases the complete cash flow statement of Facebook. It is like a guide for you to check your efforts for the past few days. If you have been working hard, I am sure you would enjoy the glory today! It is a matter of 2 minor steps: Categorizing Balance Sheet items of Facebook in Operating, Investing and Financing Activities and then taking difference of two consecutive years. Some numbers also need to be taken from the profit and loss account (i.e. Income Statement) like net profit. How do I create the model then? Remember to maintain discipline – hard coded numbers in blue, calculations in black. I am sure if you tried hard, you would have got it right. If not, let’s discuss the issues that you faced and start learning together! Release all your Pains on our forums and Blogs and we would be happy to discuss your modeling troubles! Now that we have the historical financial statements of Facebook (P&L , B/S and CFS) in place, we move forward to model historical drivers. Historical drivers are like crystal balls to predict future. Most of the revenue drivers would be in the form of growth and Costs would be percentages of Revenue. We would give more details in our next blog. In the meanwhile try to build historical drivers on your own!